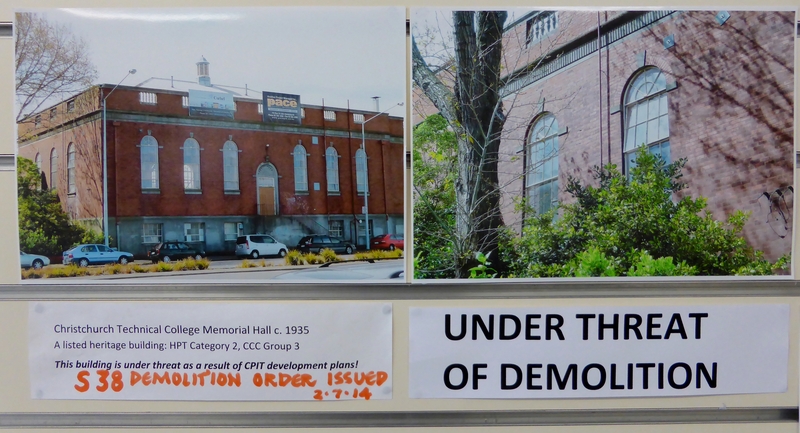 Concerned citizens and Canterbury heritage groups including Historic Places Canterbury, IConIC and Civic Trust are appalled at the news that CERA has issued an s38 demolition order on the Christchurch Technical College (now CPIT) Memorial Hall at the request of CPIT. This imposing building was opened in 1935 as a specially designed memorial to the supreme sacrifice made by 71 former pupils of the Technical College who were killed in World War 1. The result of this decision by CERA is that the public has no opportunity to have its say on this important matter: yet again Christchurch citizens are being denied a say in the future of their heritage. This is an unwelcome reversal of an earlier decision by CERA to decline the application by CPIT for an s38 demolition order: the original intent of CPIT’s application for an s38 – to avoid having to go through the public RMA process – has now been achieved. It is a disgrace that the CPIT authorities would consider the desecration of the sacred status of its war memorial in the name of progress – particularly in the year of the Centenary of the outbreak of the First World War! While it is laudable that CPIT is undertaking a major development of its campus at this time, it is lamentable that such insensitivity is being shown by it to the memory of those former pupils of this site who made the ultimate sacrifice for the nation. The intended demolition of the Memorial Hall makes a complete mockery of the government’s public pronouncements of reverence for the acts of bravery of our predecessors. We urge CERA to re-examine this decision and CPIT to explore ways in which the building can be integrated into the new design for this part of the campus.